Viz Media massively upgrading to the digital era, Seven Seas becoming one of the most beloved publishers, and newcomers and comebacks in the physical/digital manga scene. *DISCLAIMER* I am just a fan doing general observations about the manga industry and chiming in with my thoughts; I have no insight into the inner workings of manga licensing. This is wonderful graphic novel for kids of any age with gorgeous nature scenery for anyone who remembers exploring the woods. Note: This only works with uppercase fonts! If you’re using lowercase fonts, you will have to google another method. Ran has a magical pair of Nike sneakers that transform her into an adult, but what kind of hijinks occur when a little girl in an adult body goes on adventures? Rohan Kishibe from Jojo’s Bizarre Adventure goes on a journey to the Louvre to find the darkest, most evil painting stored in the famous art museum’s archives. We open up with a question: Have you seen the blackest color in all the world? (well actually, maybe) For Rohan, who deals with ink on a daily basis as a manga artist, it is an intriguing idea that helps him fly to France to see this mysterious painting. Finally some of the stuff that I’ve lettered a few months ago has been released. 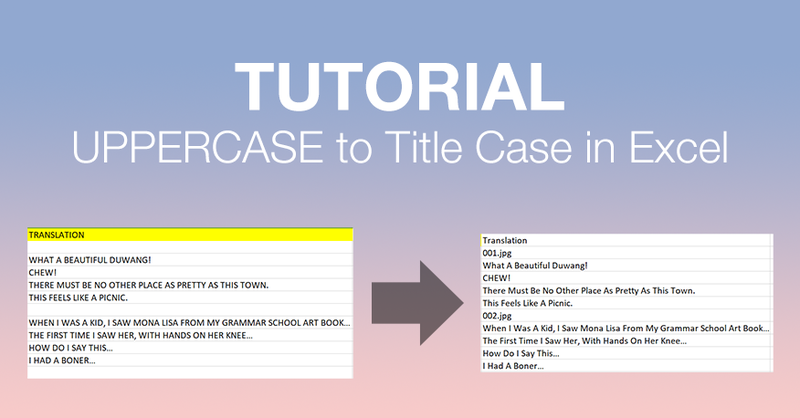 Luckily, the first title provided layered files for chapter 1, which I’m eternally grateful for! The other ones were mostly subtitled SFX which I’m also grateful for… hopefully the rest of the titles that I’ve worked on gets released soon. I’m actually going to be taking a break from lettering for a short while but I’ll be back! A cute series where someone is reincarnated as a wall in an apartment where they can observe yuri relationships up close! It’s actually super hilarious and yes, I originally was hooked with the kabedon cover. “As an outsider, I want to silently protect and watch over the love between women…,” said a Yuri fanatic that got hit by a car and reincarnated as a wall in a certain apartment! And for some reason, the residents of the apartment room are always two girls in yuri relationship… Let’s support these cute and heartwarming couples together with the passionate wall in “Yuri Wall”! Check out volume 1 on Bookwalker, Comixology, or Kindle! Series link HERE! I would like to focus on the manga portion of The Beat’s thorough analysis of BookScan 2017. NPD BookScan tracks between 80% and 85% of print sales according to Publisher’s Weekly. FYI Brian Hibbs did an amazing job on this report and went crazy into the numbers portion in a way that more casual readers could understand. He kept mentioning “long tail,” which is “used to refer to the large number of products that sell in small quantities, as contrasted with the small number of best-selling products.” Apparently, manga has a long tail? I only skimmed the article since it’s about 15K+ words (90 min read) and focused my attention on the manga portion. If you want to check out last month’s BookScan chart, see Feb 2018 Top 20 Manga Chart. With over 10,248 items listed, 5.9 million sold for a total of $85.6M, manga seems to be selling well! However, compared to 2008 when 7842 items listed, 10.2 million sold for a total of $100.8M during the manga boom, it pales in comparison. Remember that Borders closed in 2011, which led to many US manga companies to shut down. 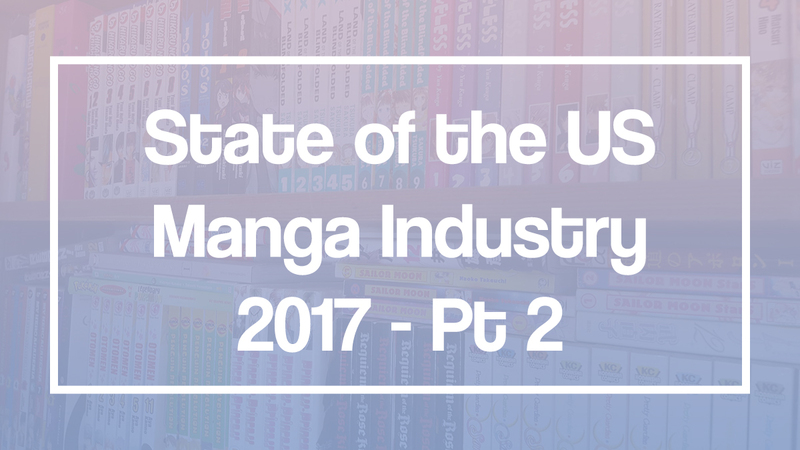 Let’s see the top 6 manga publishers of 2017 and analyze the numbers after the break! As a manga lover, this past year has been amazing for digital releases with Kodansha USA picking up the speed on volume releases.. We can strongly say that seinen, sports, and josei manga have a chance of getting licensed again! 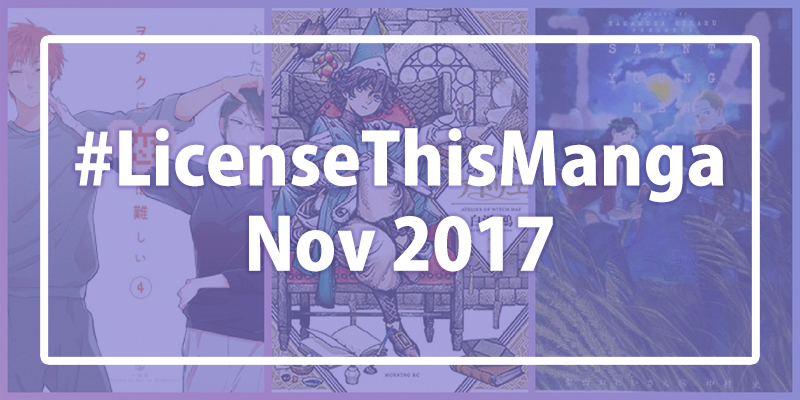 Seven Seas Entertainment now includes a monthly manga request survey! You can also give feedback to Weekly Shonen Jump with their weekly feedback survey (even if you’re not subscribed). Last time, I talked about manga industry guests that are brought over to US anime conventions. Here’s an overview of the English manga publishers that are worth mentioning.